← Priced out of the market once again. Don’t sit that close to the TV, you’re ruin your eyes. 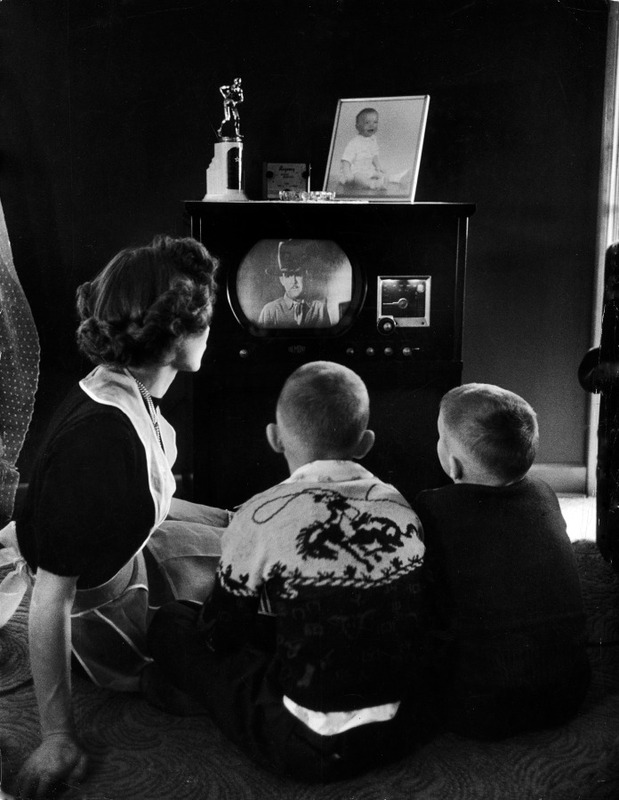 which shows a mother and her two children watching TV in 1950. Happily, science has given the lie to this old wives’ tale. Notice that the image is being reflected in a mirror, the screen being on the top of the set instead of in the front. 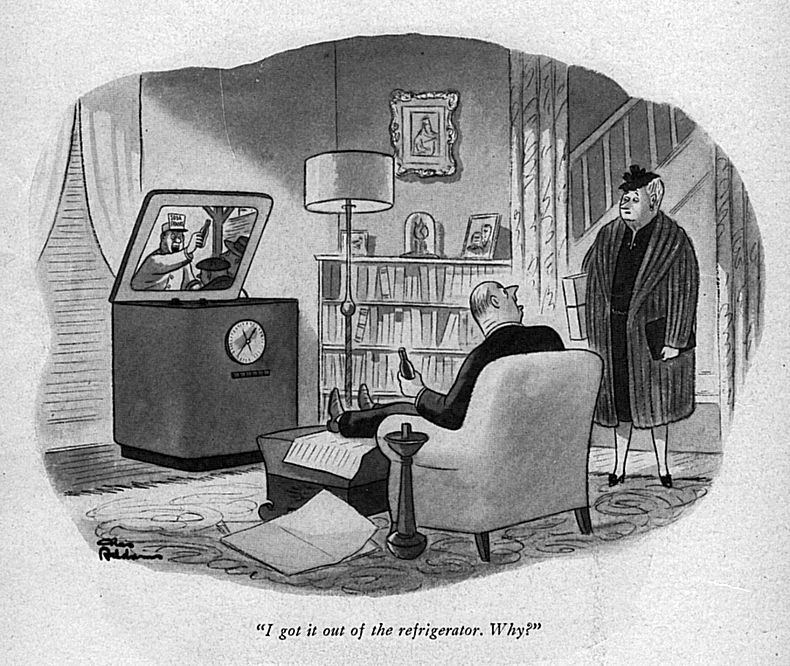 Charles Addams drew a set like this once, and I always thought it was very strange, never having seen a television like this. 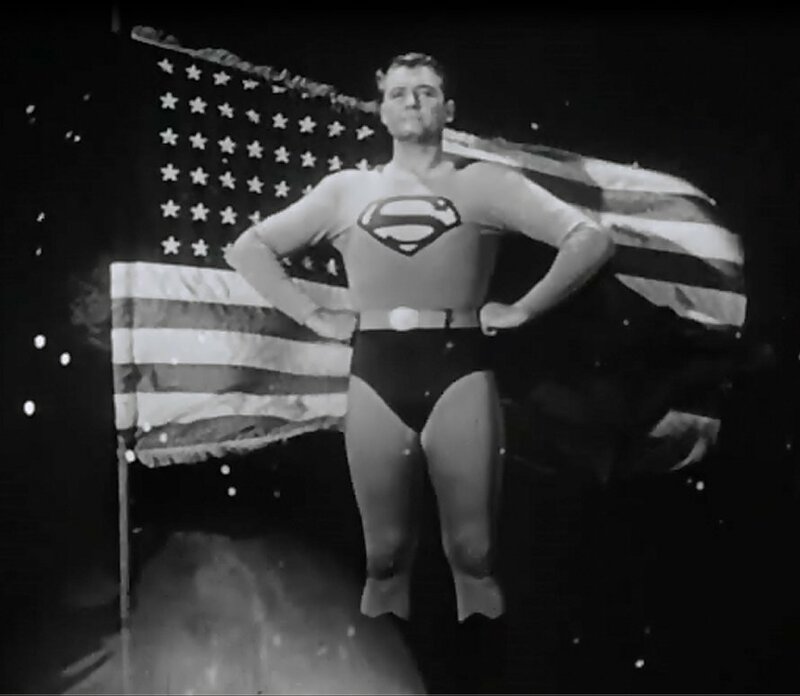 With my legs on the arms, in the same position as George Reeves (my mother had even made me a wonderful Superman costume that I would put on for the event) and along with Superman, fight for truth, justice, and the American Way. 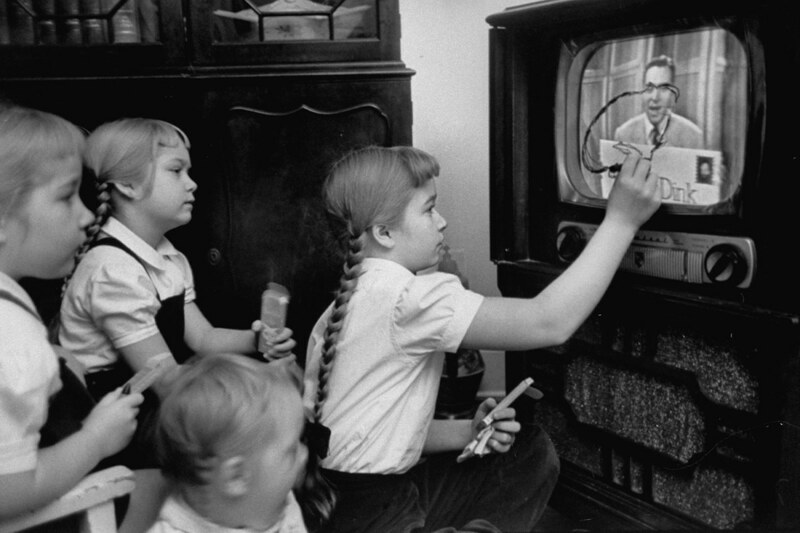 Six-year-old girls use a “Winky Dink” drawing kit on their home TV screen as they watch the kids’ program, 1953. 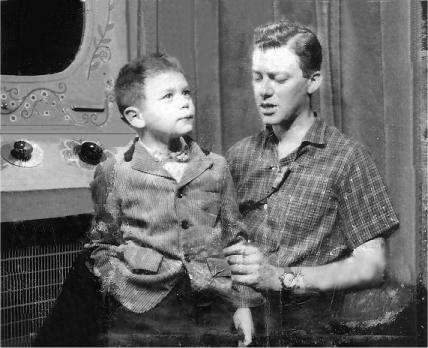 The show, which aired for four years in the 1950s, has been cited as “the first interactive TV show,” especially in light of its “magic drawing screen” — a piece of plastic that stuck to the TV screen, and on which kids (and, no doubt, some adults) would trace the action on the screen. I had one of those. I remember using that kit to help Winky Dink save the world on more than one occasion. 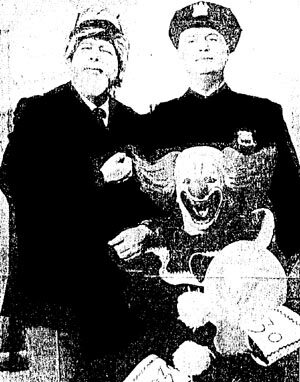 Here we see Captain Allen Swift from the Popeye show (I cried when he was replaced by Captain Jack McCarthy), Officer Joe Bolton from the Three Stooges, and of course, Bozo the Clown. Then there was Sandy Becker – the photo above also appears on the Wikipedia article, and happens to feature yours truly as a guest on the Sandy Becker Show, thanks to some judicious string-pulling by my theatrical mother. Sandy’s show was introduced with Bert Kaempfert’s “That Happy Feeling” – if it sounds strangely similar to “Swingin’ Safari,” that’s no coincidence, since Kaempfert wrote that one too. “Puffin’ Billy” will forever conjure up images of dear Bob Keeshan in my mind. This is a rabbit hole I could follow forever, the memories just keep coming back in waves. Rabbit hole? Why, that makes me think of Crusader Rabbit… but I’ve got places to go and a dairy assignment to fulfill, so I’d better wrap this up or I’ll be here all day. 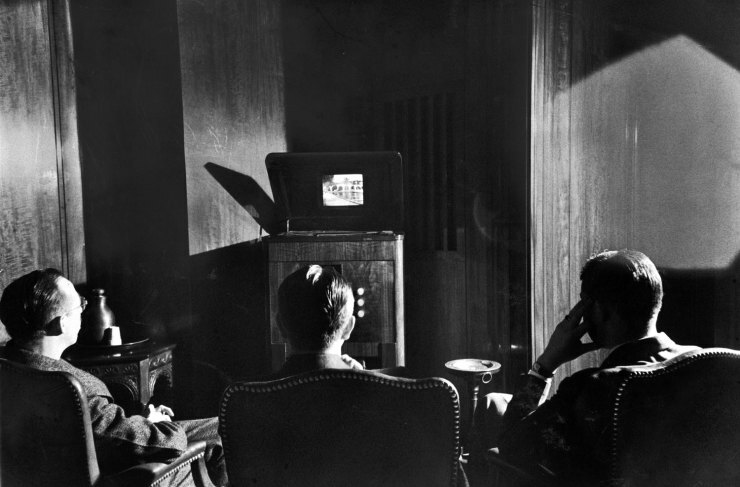 This entry was posted in History, Items of interest and tagged Early Television. Bookmark the permalink.